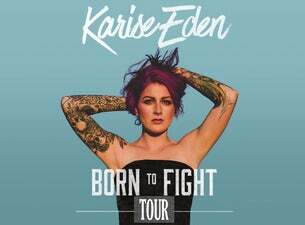 One of world's most distinctive singers and arguably Australia's best soul & blues voice, Karise Eden hits the road to showcase her brand new album Born To Fight. She will perform songs from her latest release as well as the soul classics that she is known and loved for. At just 26, Karise Eden has achieved so much - her debut album was the biggest selling album for a local artist in 2012 and broke ARIA Chart records. Her follow up 2014 album 'Things I've Done' achieved Gold sales status and she's just released her third album, 'Born To Fight'. In 2018 Karise is the fittest she's ever been, and is reaping the rewards! She says, "Since working out and developing on my core strength, my high notes are stronger and my lower register is thicker and richer." Fans are in for a treat! For an unforgettable show, don't miss Karise Eden live in concert.